Onlinevarsity app available on all Android devices. Access your ebooks, videos, event updates & notes anywhere, any time. Onlinevarsity is Aptech's collaborative cloud-based learning platform for all its students. 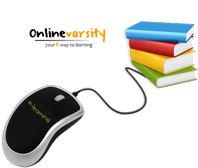 Enroll with Aptech and register on Onlinevarsity for e-books, video tutorials, articles and expert chats. With the world constantly shifting to the virtual platform, we believe that education too should move beyond the classrooms. Onlinevarsity is Aptech’s unique offering for its students that provides additional benefits beyond classroom lectures and notes. In addition to learning from the experience and knowledge of faculty members, students receive all their study material on the portal. Students also have access to reference material, articles, blogs and expert video tutorials related to their courses. Once registration is complete and confirmed, students will have complete access to all study and guidance material on Onlinevarsity. Enroll today, benefit from the vast resources of learning, and make a dream career come true!